Today we take a look at a cool counter top aquaponics system I found on kickstarter from Back To The Roots, the same guys who brough you the Grow-At-Home Mushroom kit. Basically they’ve taken something many of us are familiar with (Aquaponics), and shrunk it down into what they hope will be an easy to maintain counter top system that you can put in your kitchen. They bill it as a “Self cleaning fish tank that grows food”. First of all, i’d like to commend them for at least giving it a try, as anything which brings hydro/aquaponics to the average consumer is good for the movement in my opinion. Now, most aquaponics guys I showed this to said it wasn’t going to work, or that it would have limited results, and frankly I concurred with that as from at least my experience there is are some key areas where this thing is going to fail based on it’s design. +1 for their packaging, it felt like unwrapping a new iPhone or something and I was actually pretty exited at how nice it looked. Inside this package is the aquafarm itself, which requires no real assembly other than placing the pump into it’s holder, as well as a few months worth of beta fish food, your usual tank cycling liquids such as a dechlorinator agent, some bacteria to help get the nitrate breakdown process going etc. All sourced from a company that seems to be an upstanding green oriented business with all organic ingredients where possible etc. Let’s put this thing together and see and see how it all actually works. The only real assembly on this unit is taking the pump out of it’s plastic wrapper, attaching the air hose to it, and then placing it snugly into it’s compartment. Under the air pump is a little insert that acts as a noise dampener which allows the pump to run almost silently. Very simple, a 4 year old could assemble this, so that means maybe 50% of people will actually pass this step without error. Take out your bag of expanded clay rocks (included), wash it off in one of the netcups until the water coming out of the bottom is clear and all sediment has been removed. Take 1 netcup worth of the rocks and line the bottom of the tank with it, this bed will allow beneficial bacteria to grow on it which will aid in the nutrient breakdown process. Fill your aquafarm with tap water (preferably room temperature, so maybe let it sit for 15 min or so). Add about half a cap of DChlor solution to it to rapidly neutralize the chlorine in your tap water which would otherwise kill the beneficial bacteria. Fill your netcups with the remaining cleaned rocks (Shown here with seeds already in the netcups). Clean your beta fish by putting him in some dechlorinated tap water, then add in some of the fish bath cleaning solution (included). Let him sit for a few minutes and get nice and clean, then toss that water and put him in fresh dechlorinated water. [OPTIONAL] Add kickass castle. Fishes dig castles. Now toss in your beta fish and let him enjoy his new home, where he will spend the next several months fertilizing your crops with his nitrate rich fish poop. The aquafarm comes with several varieties of seeds which all should grow fine in this system. It comes with some lettuce, some wheat grass, and some basil. For the purpose of this review I will be using the wheat grass as it grows in only 2 weeks, and will also use the lettuce in 1 of the netcups, though that one will take as long as 68 days to grow to maturity. So How Well Does This Actually Work? For me it went about as expected. Wheat grass is a very resilient plant which requires almost no nutrients and could grow inside the actual fish tank itself if I wanted it to, so it’s of little surprise that it grew nice and healthy here. The lettuce’s fate is still yet to be seen as it has only had two weeks to grow and it takes at least a good month or two before it grows to a size you are able to harvest. 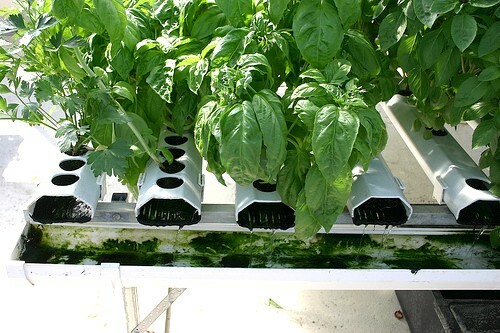 Keep in mind, this is not hydroponics, hydroponics allows you to grow about 50% faster, I could grow harvestable heads of lettuce in 3 weeks flat in hydro, but with aquaponics it’s less about performance and more about sustainability and creating a closed loop where the fish feed the plants and the plants clean the water for the fish. So as you can see, it’s clearly getting enough nutrients and I expect that if given enough time it will grow into healthy lettuce. One thing to note is that, as one would imagine, the windowsill of your kitchen does not get a whole lot of direct sunlight, hence you can see that the lettuce is a bit leggy. In other words, due to a lack of direct light, it is expending energy on growing tall in order to stretch towards the sunlight, notice how most of the leaves are facing the window which is where the most sun comes from. This is not ideal, but is to be expected with anything grown on a windowsill. Let’s talk about the basil that came with this system now. I didn’t try planting it because it takes a long time to grow, and also because I know for a fact that there isn’t enough light coming through my window to sustain them. Basil wants 10 hours of direct sunlight per day, it is not going to get anywhere close to that on my windowsill. It may work where you live depending on how much light you have, but where I live it just isn’t going to happen, and I’ve tried before. Looking at these roots, again I find what I expected to find. This ain’t hydroponics folks, we can’t expect perfect roots because we aren’t giving the plant ideal conditions. They are healthy, but as you can see they aren’t that pearly white we would prefer to see. All in all this isn’t a negative, it’s just a limitation of the medium rather than a reflection on this specific system. For all intents and purposes, it turned out well considering it was grown with only fish poop and barely any sunlight. I knew prior to buying this that keeping this thing clean was going to be an issue, and I was right. I mean, the water is exposed to light and is rich in nutrients, algae is going to grow. That’s just nature, you can’t stop it. You can’t treat it with anything either since a fish is living in there, and also because you don’t want to kill off the good bacteria. To give credit though, the Aquafarm’s instructions said if the water gets cloudly that you should put some snails in there. It says 1, but 1 is not enough. It took me a total of 6 nerite snails before it became a truly self-cleaning tank. That was an extra $6 of cost but I love snails and their infinite ability to eat anything in a tank so for me it was no big deal. With the addition of the snails, everything stays clean. The snails however can’t get into the air hose tube which means it never gets cleaned. It gets dirty FAST, and stays dirty. I don’t know how to go about fixing this, and I imagine that over time it would probably become an issue. As long as the water can continue being pumped up to the grow tray, I don’t think it will be a problem but I fear some doomsday scenario where it jams up completely. If that happened, I would take the top off and clean the plastic tube with some pipe cleaners, which I imagine would buy me another month or so. So all in all it’s not a big deal. This unit costs $59. With that in mind, I think it’s a good value for the price. You arent going to grow a bunch of free food off this thing, but you could certainly enjoy some simple herbs and greens every couple of months that grow themselves without any input from you, it doesn’t require pH balancing or anything other than feeding the beta fish 3 of his little food pellets every day when you leave for work. The wheat grass can be harvest about once every 1.5 weeks and I’ve been using them in my morning smoothies so I’ll probably keep growing that for the time being. If it were me, I’d grow mainly microgreen length sprouts on here and just harvest every week as opposed to trying to get basil or lettuce to grow in here. So to the naysayers, one fish IS enough to service 5 small plants. It WILL stay clean if you enlist mother nature’s best cleaners, the snail. And it IS worth it for a measly $60. It looks cool, is a good conversation starter, and if you’re going to have a beta fish as a pet, may as well put him to work growing crops instead of floating around in those stupid little cups. I would recommend one of these if you have kids, I know my 4 year old loves it as she can take care of it all by herself, Would be a great project for a classroom as well. All in all, I want to thank Back To The Roots for bringing this to market, and I am glad their kickstarter got funded, it is a welcomed addition to the windowsill gardening collection. BONUS: It even comes with a coupon for a free Beta fish from Petco. Not bad. ← Hyundai Nano Garden: Who needs a fridge when you could have a farm in it’s place?